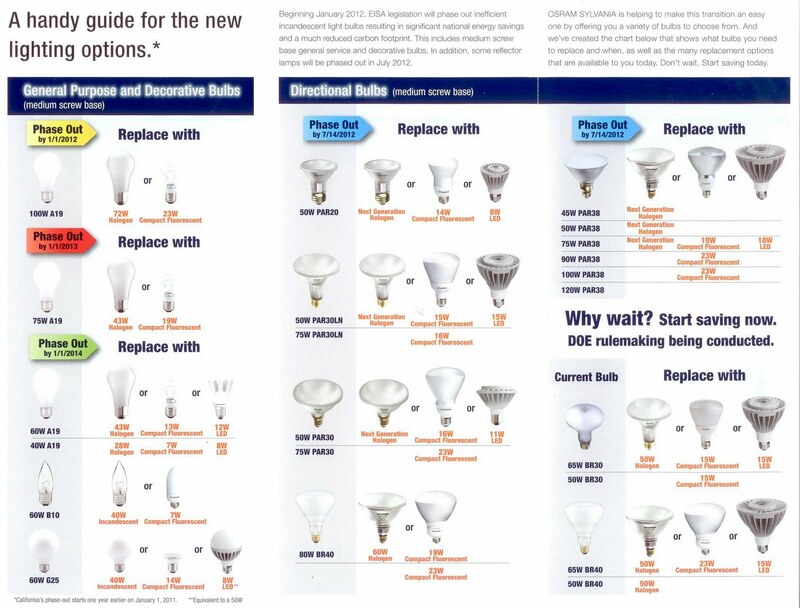 Sylvania has come out with this great guide to help you decide how to replace the incandescent light bulbs that will start getting phased out on 1/1/2012. For example, you can replace a 100-watt A19 bulb with their 72-watt halogen or a 23-watt compact fluorescent. We don't have any 100-watt LED equivalents just yet, but it won't be too much longer, I'm betting. 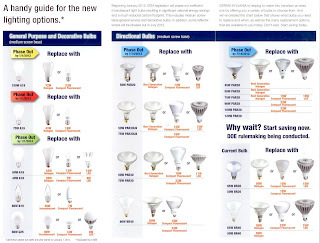 75-watt A19 lamps won't be phased out till 1/1/2013, and then 60-watts go on 1/1/2014, so we have some adjustment time, too. I personally am a fan of the 72-watt halogens on dimmers. 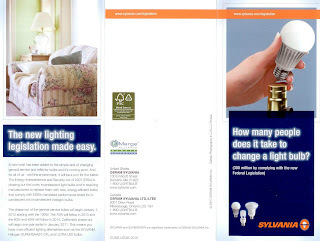 First you save energy by the lower wattage, and then you save even more when you dim them (plus dimming extends the life of the bulbs, so you don't have to buy replacements nearly as often!). The quality of the halogen is very similar to incandescent, so you won't see big color shifts or anything like that. As Sylvania says, "don't wait ~ start saving today!"